The ‘Kimon M’ was originally launched in January 1952 in Kiel, Germany, as the ‘Brunsbuttel’. Later in 1953 she became the ‘Ciuad de Calcuta, the ‘Angela’ in 1964 and in 1971 the ‘Kimon’. In 1975, after being sold to the ‘Ianossis Shipping Company of Panama’, the ‘M’ was added. She was a freighter with an addition of 12 passenger cabins to make some extra money, as more freighters did in that time. She was equipped with a refitted 4-stroke 8-cylinder Diesel engine which could deliver almost 3000 HP and a top speed of 12 knots. The ship is refitted several times during her lifetime. She was widely regarded as a sturdy and sea worthy ship. In December 1978, in the small Turkish port of Iskenderun, the ‘Kimon M’ was loaded with bagged lentils, destination Bombay India. Two days later the ship arrived at Port Said. After passing the Port Said, with its tiring paperwork, rules, regulations, customs, pilots and finally passing the Suez Canal and finally the Strait of Gobal, the ship could continue its journey. Convinced that troubles and dangers were behind him, the captain relaxed. He ordered his first mate not to alter its course for the next three hours and finally went to bed. However, just on the moment he stepped in, the ship with his engine full speed ahead ran onto the north-east corner of the Abu Nuhas reef. The date was 12 December 1978. Luckily the freighter ‘Interasja’ was close by so the crew could safely abandon ship. There is a report of a claim from the ‘Kimon M’ had a collision with another freighter. Which one is unclear. The Chrisoula K ran ashore three years later. One of the possibilities is that another freighter ran onto a reef and the ‘Kimon M’ tried to avoid it and so changed course which let to the Abu Nuhas reef. The other ship came floating again and left. 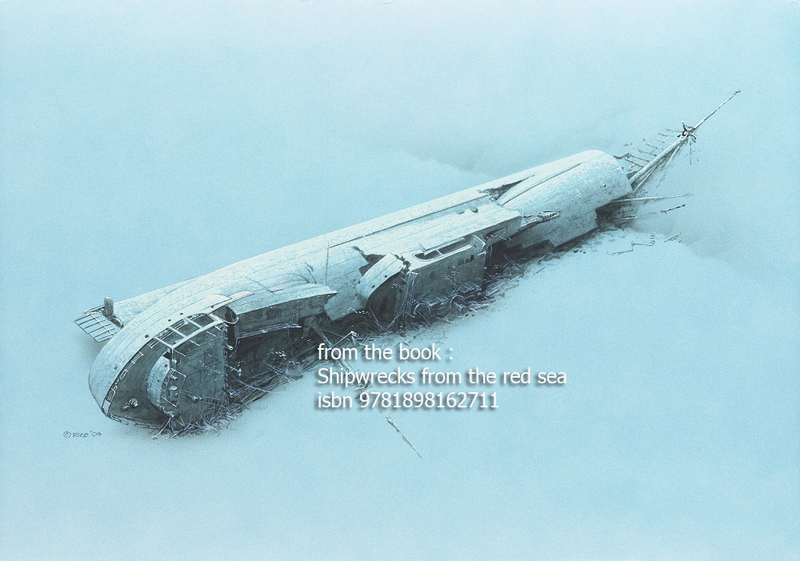 However, the initial stranding caused the ‘Kimon M’ to get solid stuck on the reef. Partly the cargo could be salvaged but most had already been in contact with the sea water and was left into the wreck. Later the engine was salvaged and weakened the ship. That caused the wreck to collapse and break into its current state, way worse than the drawing above is showing you. The ‘Kimon M’ is the last wreck on the Abo Nuhas reef. Normally safari boats are moored and the leeward side of the reef to protect them from the waves. There’s a small corridor in the reef from that location to the seaside. Going to the wrecks of Abu Nuhas means using a zodiac. 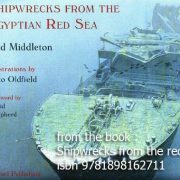 The ‘Kimon M’ is the last one of the famous four wrecks of Abu Nuhas, so it’s a long way out. Specially with windy conditions going out there is harsh and hardly worth the trip. When descending to the wreck you can immediately see the worse condition the wreck is in. Specially the last 5 years a lot of the wreck is collapsed. The ‘Kimon M’ is built in an time where ship builders could precisely calculate the needed strength of a ship and nothing more. However, a ship is designed to float and not laying on a reef. It is torn apart by storms on a lot of places. For example, the front midship, in which you had a nice swim, is now mostly collapsed. Also, the old engine room (although the engine was removed) was a nice place to visit. It is now also collapsed. Is is also clearly shown at the base of the propeller. The propeller, shaft and bearings are completely torn of the wreck, probably on impact. Today it is now tilted in comparison with a few years ago. Basically, it is better not to really penetrate the ship but investigate from the outside or just enter the parts that seems to be solid. Be aware of loose sheets of steel dangling from above. The wreck is located on the outside of the reef, near deeper water. So in the blue you can expect to see snappers, tuna, hunting barracuda’s and the like. Even dolphins can be spotted. In the wreck itself ou can find moray eel and the usual smaller fish.